Skalar, the world leader in wet chemistry technology, offers over 300 proven applications utilizing various combinations of automatic dilutions, additions, mixing, heating, dialysis, extractions, distillation, digestion, phase-separation, hydrolysis, ion-exchange/reduction and more. Skalar has developed a proven systematic approach to provide a quality system starting with complete applications engineered on customer samples to provide the best possible configuration to the customer needs and requirements, training and installation by qualified specialists and complete application and service support. The Skalar range of San++ samplers offers for each routine laboratory and application the perfect match saving operators time and errors. With the unique automatic standard preparation and over range dilution facility, high workloads are fully automatically analyzed outside working hours, without any operator supervision. 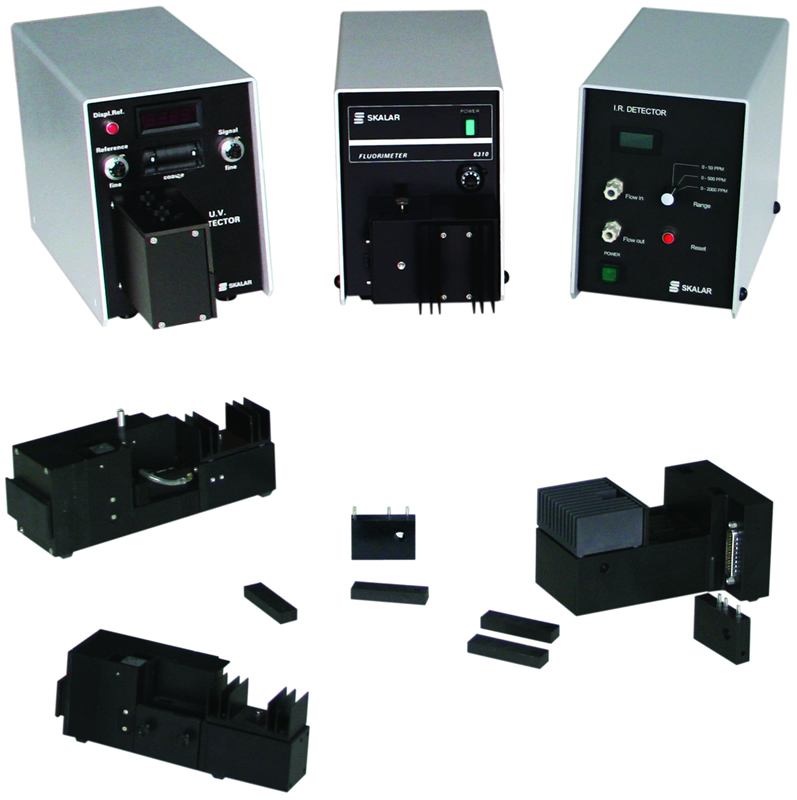 The SA1100 and SA1150 samplers accommodate up to 2 x 50 sample positions, with built in rinse pump. Optionally, 10 dedicated standard positions are available for working standards. Furthermore, they can be equipped with a second needle for dual needle sample pick-up and extended sample positions (up to 100 positions). The samplers are random access and computer controlled, the SA 1150 sampler is extended with a soft keypad to run in or computer or manual control mode. 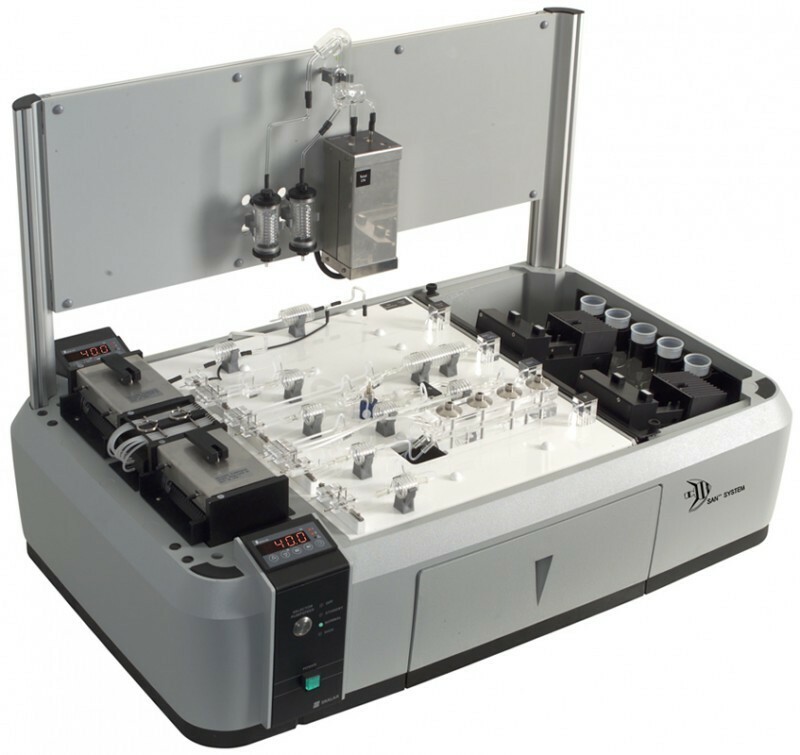 Computer controlled RØZ sampler, series 1050, for up to 140 samples with separated standard and QC sample positions, built in rinse pump, optional automatic diluter station for automatic pre- and post run dilutions, and automatic standard preparation, with optional dual sample pick up (SA 1053) and optional stirrer. 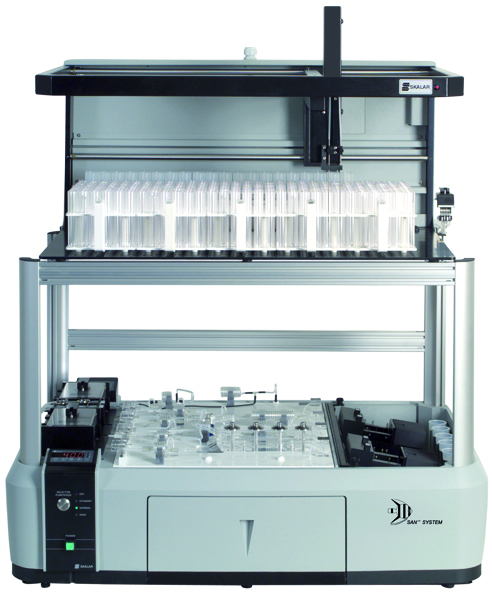 Computer controlled XYZ sampler series 1074, for 300 samples, with separate positions for standards and QC samples, with container volumes of 35 mL. Build in rinsing pump. 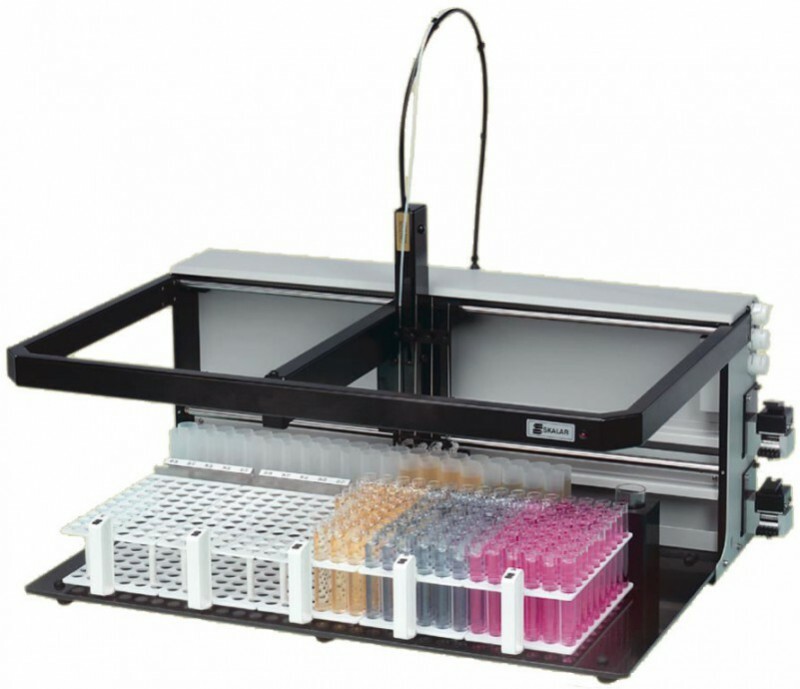 Optional automatic diluter station for automatic pre- and post run dilutions and automatic standard preparation, Extendable with 2 to 4 needles for simultaneous sample pick up with different matrices, with optional stirrer and automatic bar code reader and customized sampler container racks also available with larger footprint for more then 300 samples. 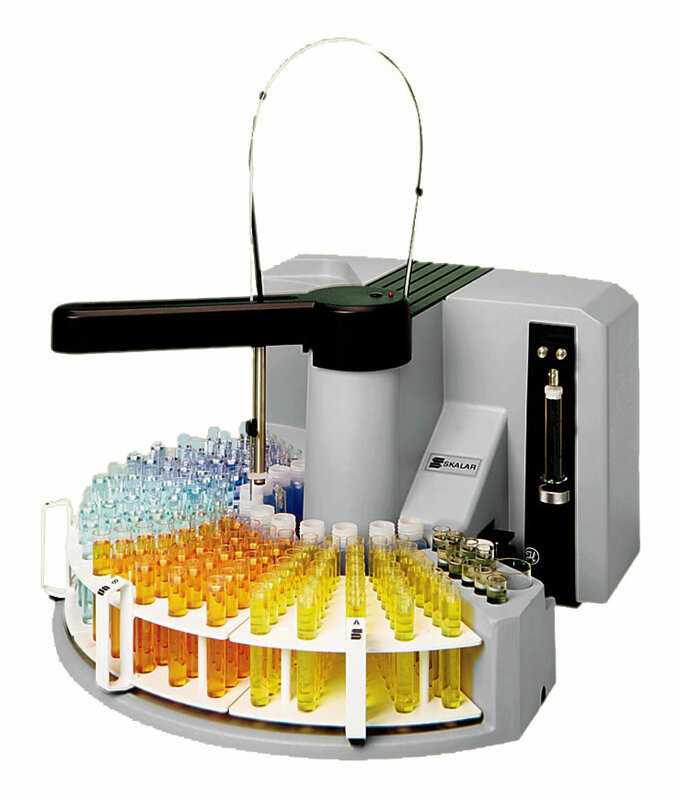 The SA1075 Random Access auto sampler carries standard 576 sample positions, divided over 6 racks of 96 samples each. In addition, there are 26 positions available in a separate tray for working standards, QC samples and drift control samples, with container volumes of 35 ml. Extendable with 2 to 4 needles for simultaneous sample pick up with different matrices. 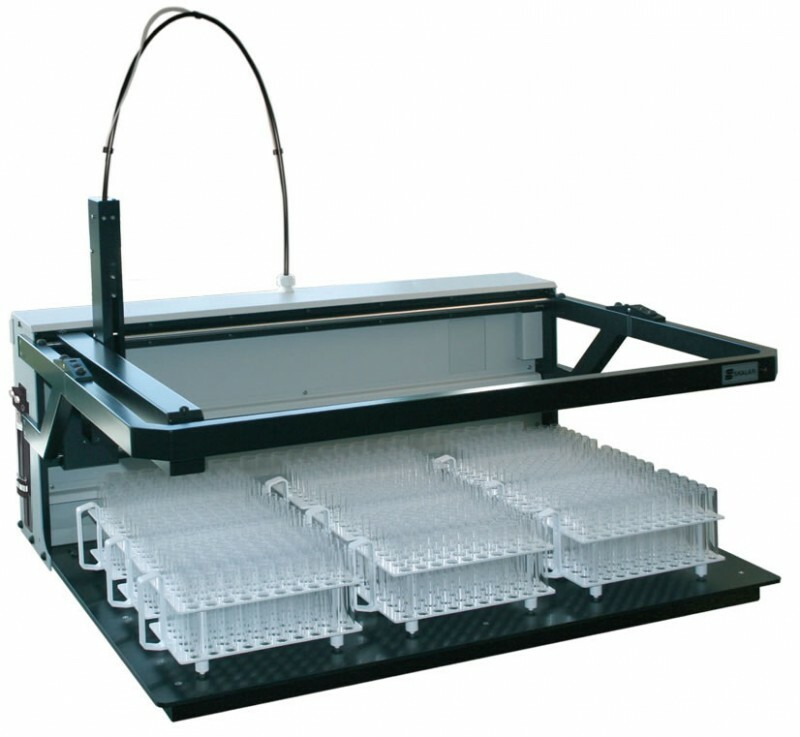 Optional automatic diluter station for automatic pre- and post run dilutions and automatic standard preparation. 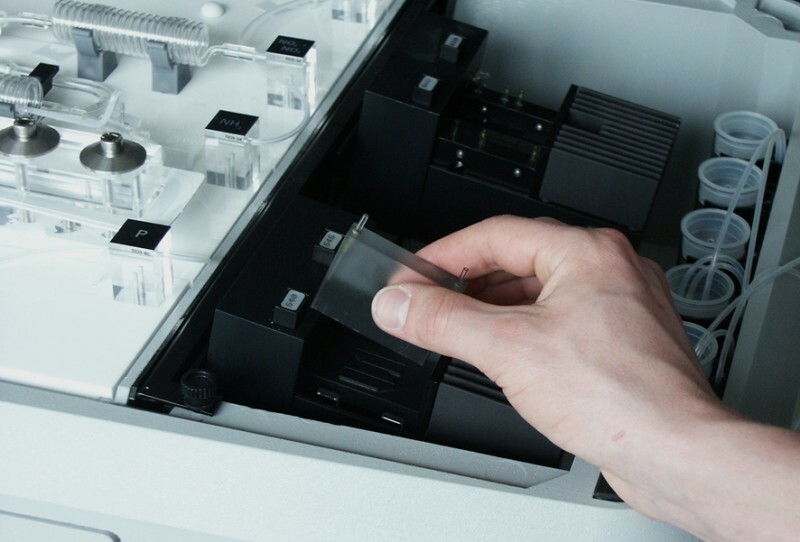 The unique concept of the chemistry section has proven its performance for hundreds of applications, with maximum operator convenience and lowest routine maintenance. 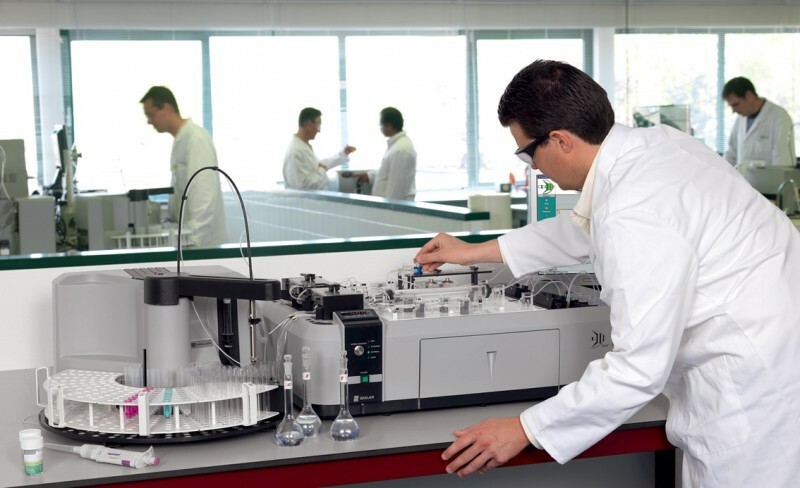 The latest developments in Continuous Flow Analysis (CFA) have been integrated into the chemistry modules. 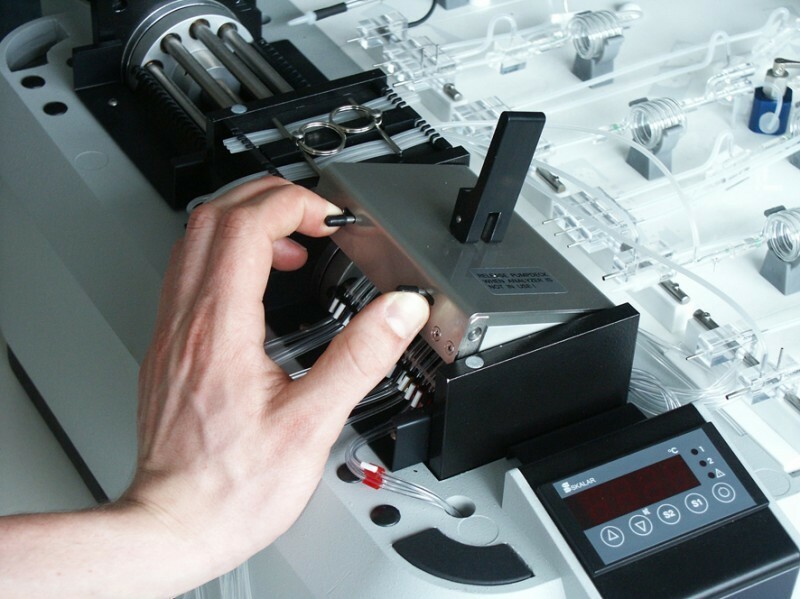 The throughput of the analyzer depends upon application and can vary from 25 to 120 analyses per hour. 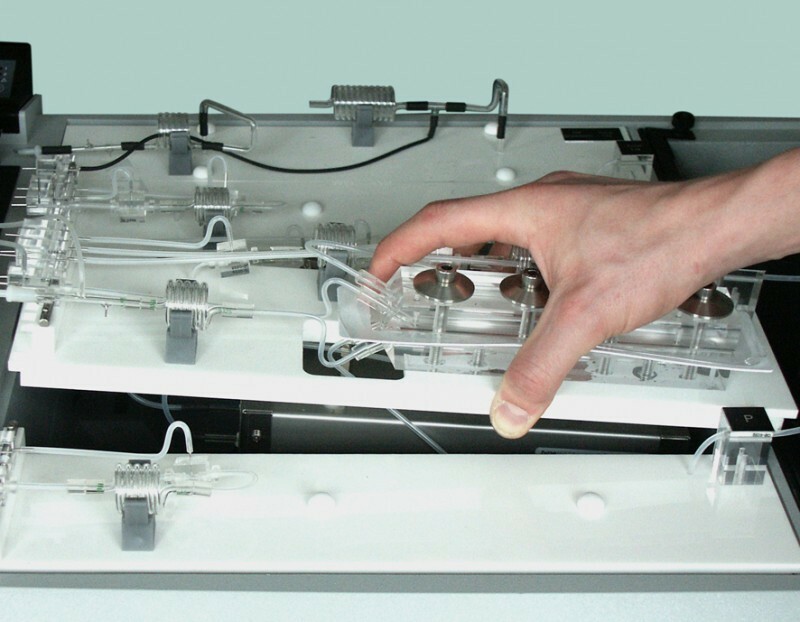 Complex manipulations such as distillation, in-line UV digestion, extraction, etc. are incorporated on the chemistry modules. Robust unique double radius pump deck for accurate dosing with up to 32 or 16 pump tubes. 2 separated pump decks for 2 x 2 channel concept. Controlled synchronized 10 channel air injection with separated build-in compressor for increased flow stability and fast start up. 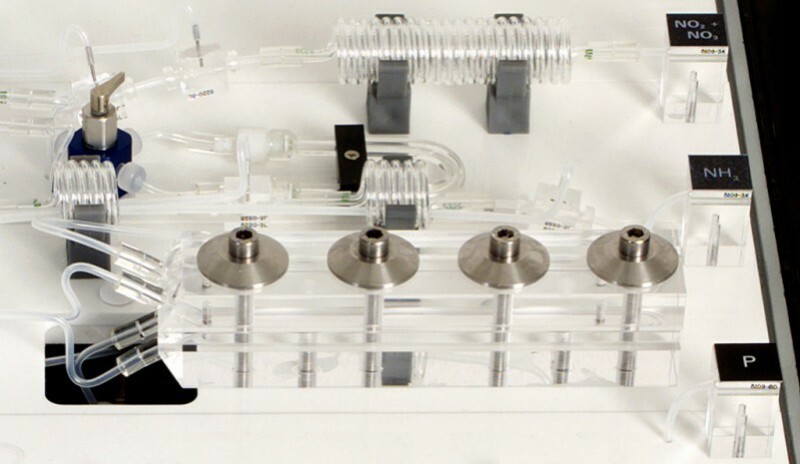 Easy access to chemistry modules with flexible ultra low carry-over connections between dialyzers, reactors, coils, flow cells and other components. 3 - Cuffs long life pump tubes. Manual operated and automatic software controlled rinsing valves for easy automatic start up and overnight operation. The Chemistry section is compact and easy to handle. It houses up to 5 chemistry modules with build in robust dosing pump and air injection system, up to 5 easy interchangeable modules with build in photometric detectors and 5 separated waste receptacles. 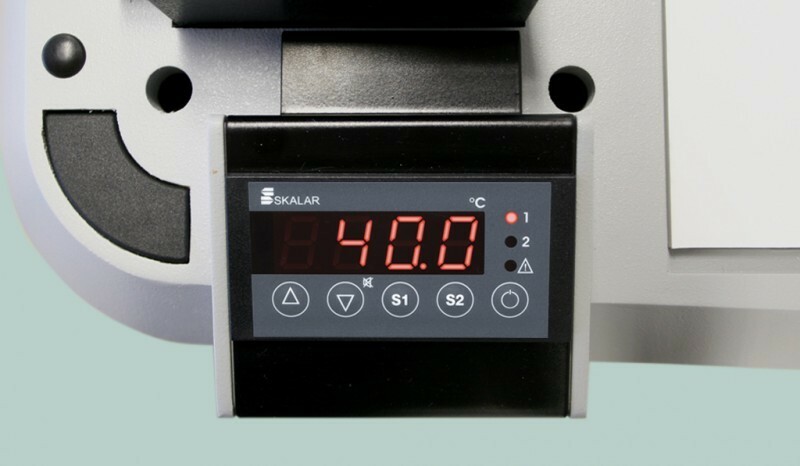 The Skalar San++ range of detectors comprises digital dual channel colorimetric detectors, the unique digital matrix correction detector with automatic background correction for specific sample matrixes, but also covers a range of detectors for I.R., UV, Fluorimetry, ISE, Flame Photometry, pH meter, Density meters, etc. The Skalar range of detectors covers all detectors required for the hundreds of Skalar field tested SFA applications available today. 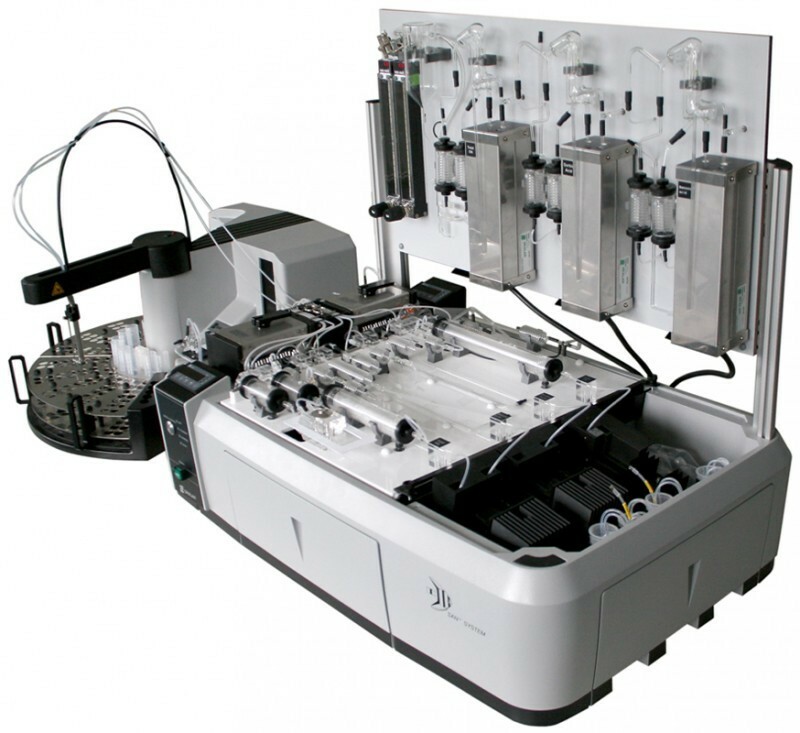 The San++ FlowAccess™ V3 data acquisition Windows® software package controls the complete analyzer, with auto start-up and shut down, hardware functions control, detector auto-scaling, pre-and post run sample dilutions, result calculation and statistics. 1 to 16 channels, with multiple samplers and multiple needles are handled simultaneous. Each chemistry can be grouped for analysis. As of it GUI the package is extremely users friendly and easy to operate, and will integrate easily into a network. The “Table wizard” tool can be used to create easily and quickly a complete sample workload table with a standard layout. The table’s structure and fields can be customized by stepping through the wizard. 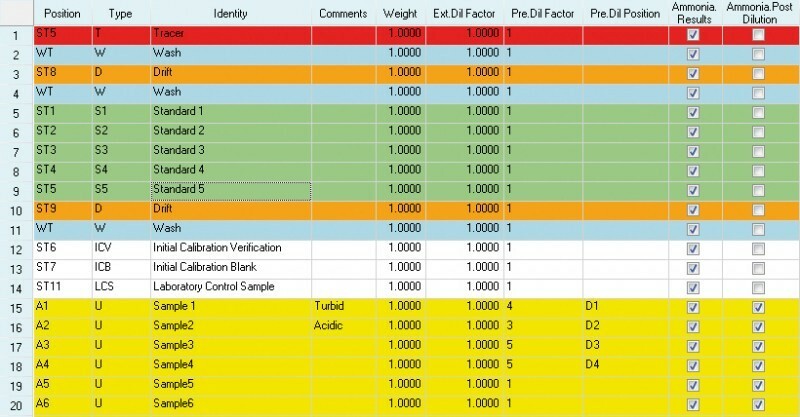 Values for the drift/wash, calibration standards and CLP intervals for the samples can be defined. 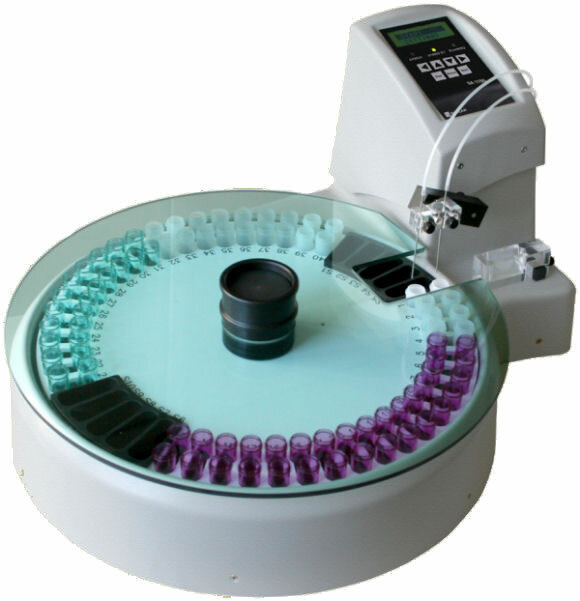 By adding the total number of samples the final analysis table is automatically made. The sample table will be displayed and for each type of sample an editable field for user comments is available if required. The table can be exported to an ASCII/Excel file. Sample workloads can also be imported from a LIMS file or ASCII/Excel. FlowAccess™ V3 includes the function of automatic preparation of pre- and post dilutions with enhanced settings. The pre- and post dilutions factors can be defined by the user per chemistry parameters. Advanced settings for automatic post-dilutions are available like series of post-dilutions where the user can define the maximum number of times a diluted sample has to be re-diluted and re-analyzed. During the run, all the analysis peaks can be viewed, each channel separately in detail or multiple channels simultaneously, maximum of 16, in one single screen view. Peak marking, sample ID and calculated results are displayed in real time. Advanced peak diagnostics is available. Real time results are calculated by 1st, 2nd order calibration curve according to ISO 8466 or 3rd order and inverse logarithm for use with Ion Selective Electrodes. The software complies with CLP protocols ensuring accuracy and precision of analytical results. The CLP protocol allows automatic actions by the San++ system if QC and CLP limits are exceeded. These QC and CLP limits are user definable and have to be set for each parameter individually. Generally the following CLP samples are defined like initial Calibration Verification (ICV), Continuing Calibration Verification (CCV), Laboratory Control Sample (LCS), Spike Recovery (SR) etc.. When a CLP sample is calculated to be outside the set limits, the analyzer executes the required action. It is possible to define up to four actions, which are for example for ICV: Re-run ICV, Re-run Standards, Abort run and show messages and Continue run and flag results. For individual runs statistical info is standard available within FlowAccess™. Flow charts display the data analyzed for QC samples in comparison to its preset limits and correction data for baseline and sensitivity drift, all during the analysis run. Optionally for data retrieved over an extended period of time, a separate software program QAccess™ is available. This program facilitates statistical evaluation on e.g. correlation coefficients, drifts, washes; multiple QC’s providing information for Residual Standard Deviation, Relative Standard Deviation, Detection and Determination Limits and more specific CFA parameters. FlowReport™ is a powerful reporting tool to generate customized reports from the results obtained in FlowAccess™. These reports allow customized set up with different configurations for data and graphics. The software enables reports to be generated quickly and easily. The design possibilities are extensive. A report consists of four parts: Methods, Results, Real Time and Calibration Curve, which have to be set up separately. All parts of the custom made report can be viewed, printed and exported to an ASCII/Excel file or in a picture format. 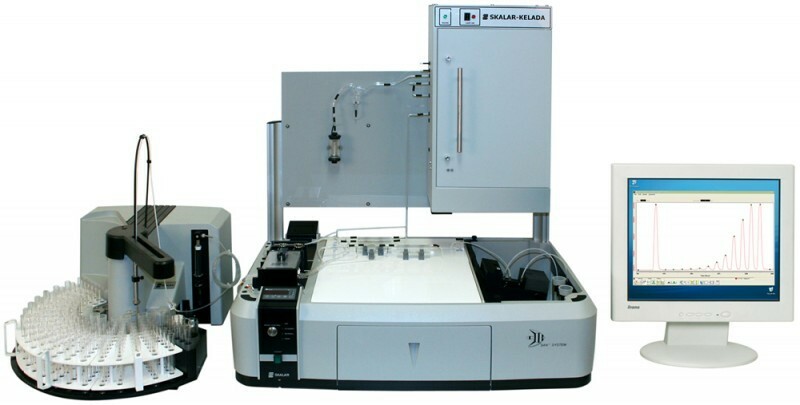 The Skalar San++ Analyzers are operating worldwide for hundreds of different applications. It is for decades the reliable "workhorse" for many routine laboratories; analyzing waters, soils, fertilizer, detergents, tobacco, pharmaceuticals, food and beverages such as beer, wine, milk, etc. Skalar methods meet standard methodology whenever possible, such as EPA, ASTM, ISO, AOAC, Standard Methods, EBC, Coresta, etc., etc. and are tested in our well equipped application laboratory. Skalar San++ Analyzers are supplied with detailed method description of reagent make up, flow diagram and any information required running a specific application trouble free for many years.